New A single 1997 RS125 disc for sale. Full floating type. In excellent condition, Same as RS250 disc but right side only. 296mm diameter, same size as CBR600R. Manufactured by SunStar. 75 US Dollars plus shipping. Beautiful !! 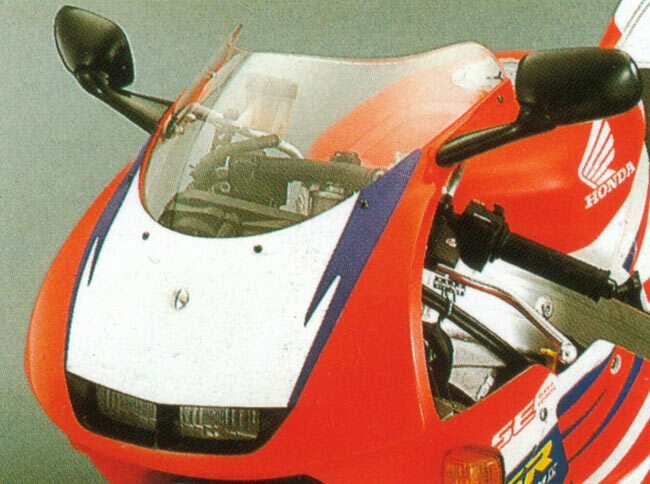 MC18 ( 1988 and 1989 ) NSR 250 Titan-iridium coated clear turn signal lenses with orange bulbs. Very distinctive Give your bike a new look. 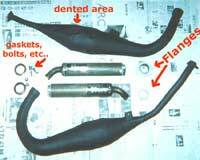 Sold as one pair ( left and right ) fits both front or rear as well as the 1989 VFR400. Priced at 28 US Dollars per pair plus shipping. Non-Titan-iridium clear lenses available also at 25 dollars per pair. New Preload quick adjusters. Made by Okumura racing, the finest and most expensive around. Super lightweight !! Makes preload adjustments a snap. 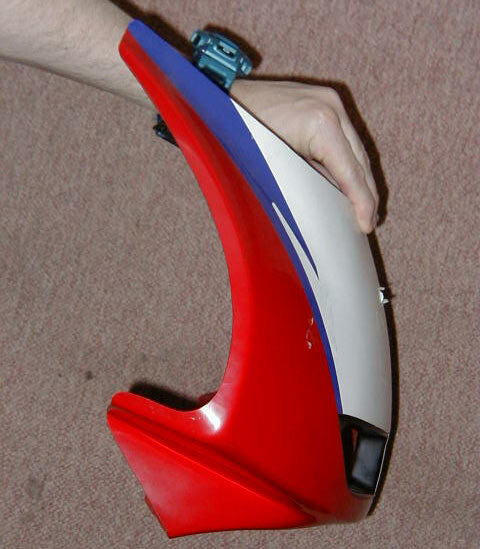 Give your bike a distinctive look too. 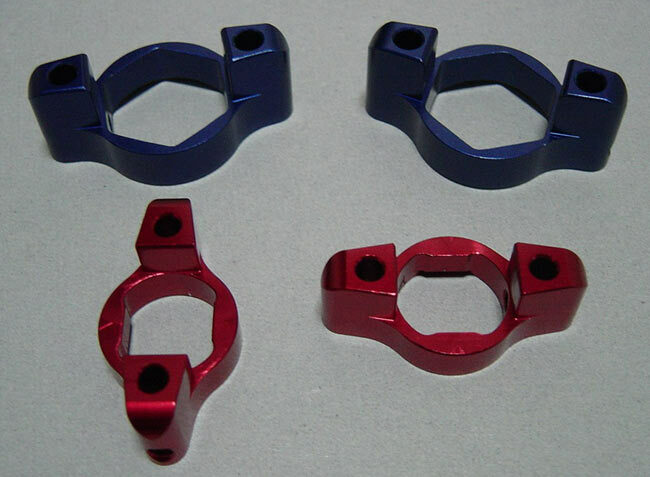 Fits all MC21, MC28 and 89SP (R 6K) Choose from blue, red, silver, black or gold. Priced at 49 dollars for one set and includes lock nuts. 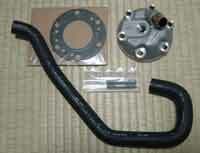 The HRC center mounted cylinder head kit. Complete kit for sale with new head, studs, gasket and a specialty radiator hose that is necessary for the conversion. 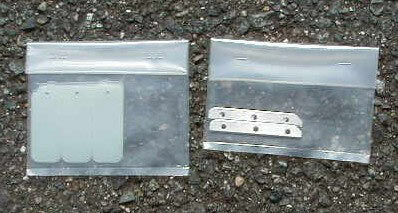 This kit requires the use of a RS250 short plug and RS250 plug cap. Increased power. 150 US Dollars for the whole kit. 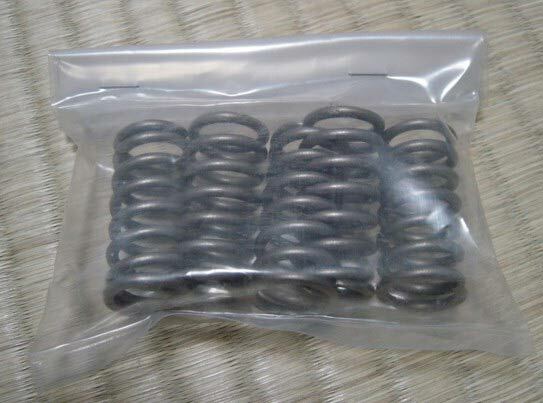 Jha racing clutch springs for the NSR 250 SE and SP. With increased power it is necessary for stronger springs to avoid slipping of the clutch. 20 percent stronger compared to the stock springs. 29 dollars for a complete set. MC21 SP model for sale in The Netherlands, ready for shipment to anywhere in the world. Click here or on the picture for more info. 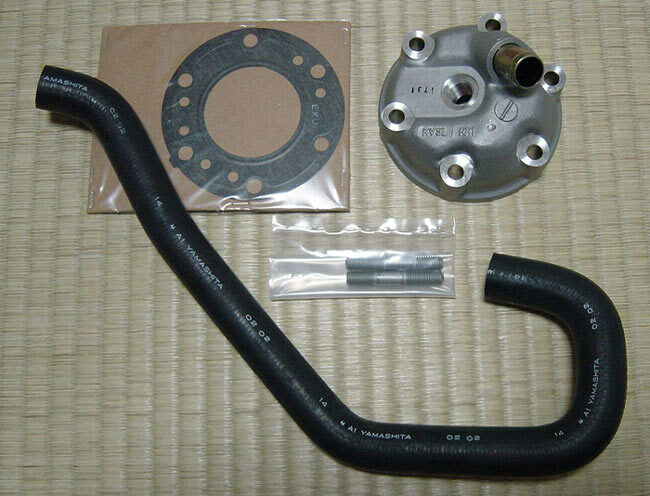 Jha Complete carb setting kit. Brand new in the unopened baggie. Having trouble ordering from Jha ? Why not order from me. MC28 is 165 and MC21 is 155 US Dollars plus shipping. HRC reed stuffers (left) and HRC reed valves with spacers (right). 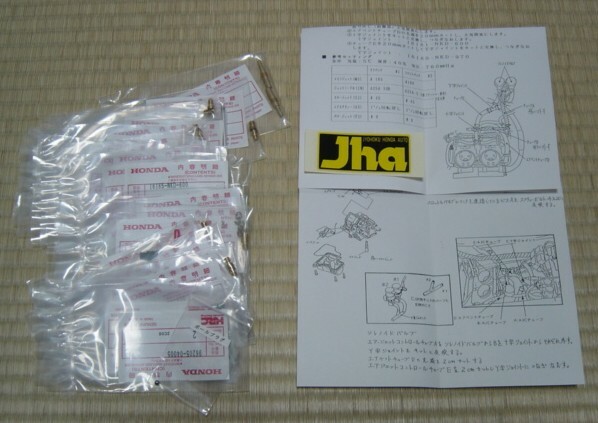 All parts sold as a set for 73 US Dollars. Awesome throttle response. 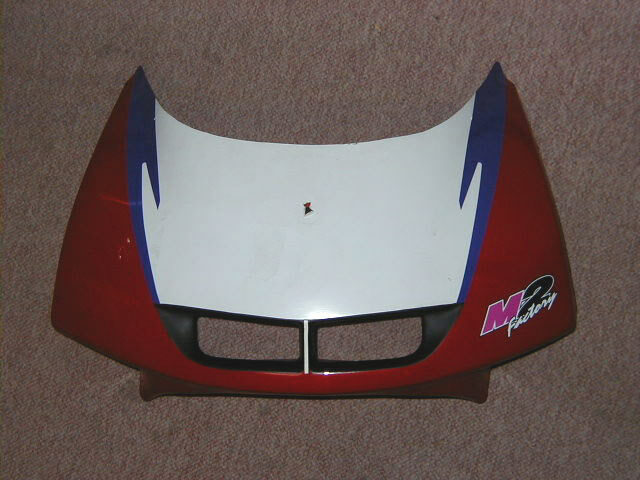 This is a split headlight upper cowl cover for the MC28 from Magical Racing. 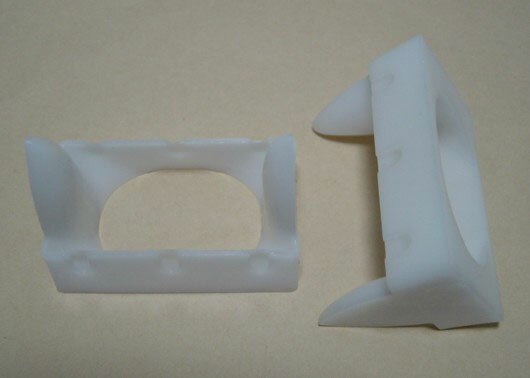 This part is out of production. New was 180 US$. 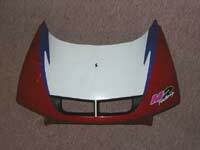 I have this used cowl covering in excellent condition for 95 Dollars. Shipping extra. A very rare item, be the only person with this in your country !! 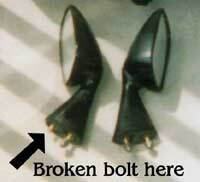 A great way to cover up a cracked upper. Click here for one more picture of the installed upper. 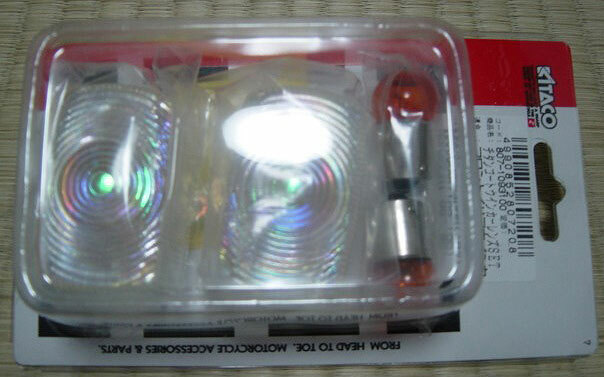 MC28 Active Floating pin conversion kit. Converts your MC28 NSR front discs to the floating style while adding a unique and stylish look. 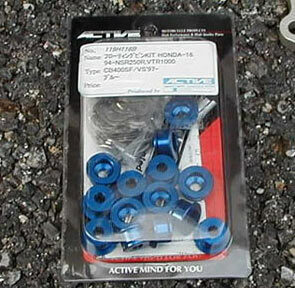 Blue anodized pins with all circlips and parts necessary. Brand new never opened. 115 US Dollars plus shipping. 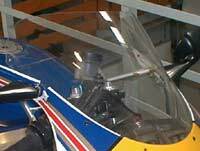 Other colors ( Silver, Red, Purple, Gold, Black chrome ) available too for 120 US Dollars for the complete kit to fit NSR models from 1988 and up, plus many more other bikes too. 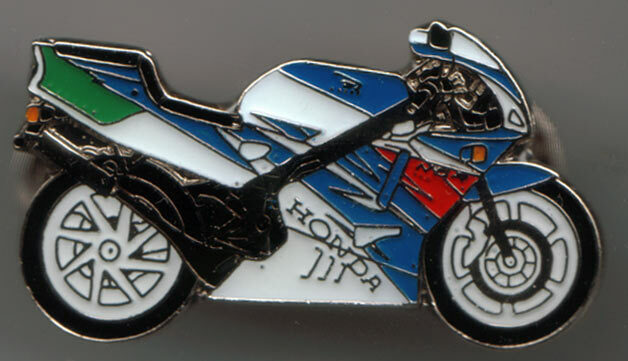 The one and only NSR250R collectors pin. Highly detailed MC28 SE model with duel fastening pins for added security. 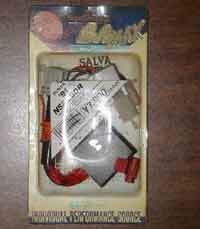 Unique and a must have item for the NSR collector freak. Rare and in limited numbers. 26 US Dollars. 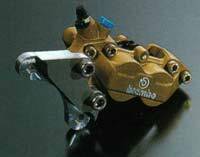 BREMBO 4 pot calipers. Drastically improved braking, lighter weight and better looks too. Brand new with brand new pads !! 395 US Dollars for one pair ( left and right ). 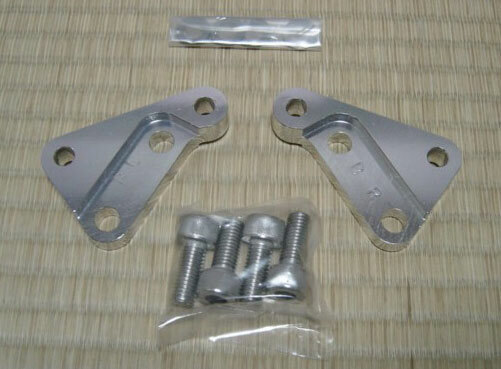 You will need the above Brembo adapter brackets as well. 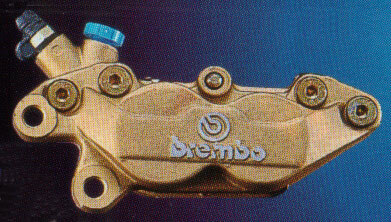 Also includes brand new brake pads !! Now out of production for the NSR, the M-Max CDI de-restrictor box. I have two for sale, MC21 and MC18 BRAND NEW IN THE BOX 85 US Dollars each plus shipping. Get them while you still can, cause M-Max has stopped making these. Easy bolt on power !! 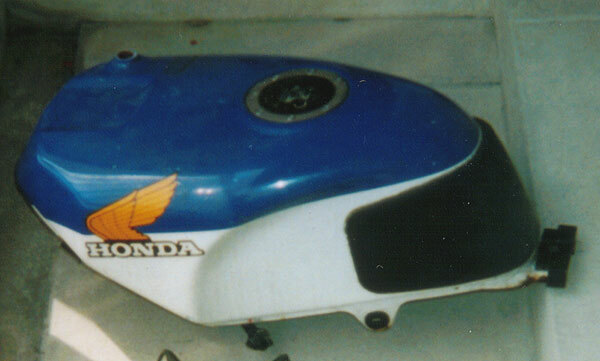 Sold MC 18 - Gas Tank. Blue and White factory colors. The tank is not dented, but has some scuffs and minor scratches. Ideal for a second tank or repaint. Sorry no key. 75 US Dollars plus shipping. 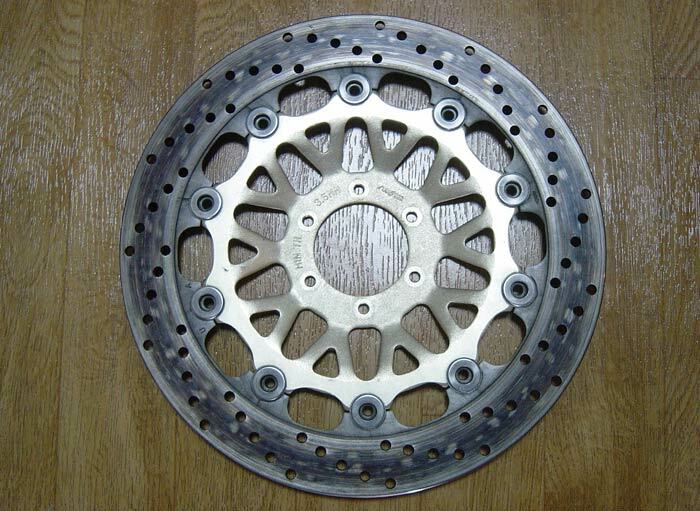 MC28 - Front wheel with disc rotors. Standard aluminum, NOT Mag-Tek. 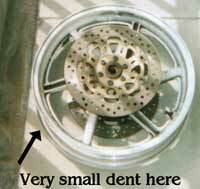 The wheel has a small dent on the right side (arrow), can be used for street riding, not recommended for racing unless properly repaired by a professional shop. Make me an offer. 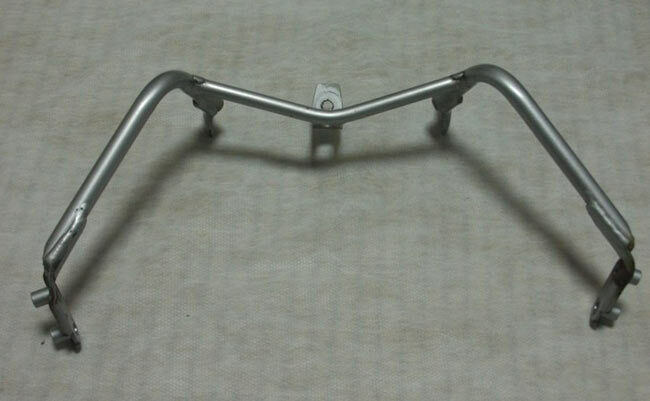 Sold MC28 - Upper cowl stay. 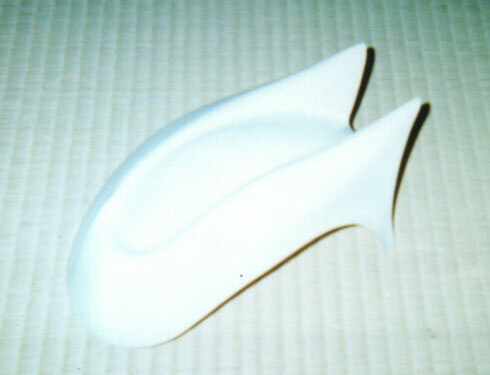 This part is used and is in fair condition. Some minor rusting around the bolt holes for the mirrors. I am super picky for my NSR, so I bought a brand new one. I would recommend a respray for picky people like me, or just leave it as is. I am asking 30 US Dollars. Japanese Street Racer Helmet Diffuser - One size fits all Shoei and Arai helmets. Brand new !! Be the only guy ( or girl ) on the block with this weird helmet accessory. 69 Dollars. Paint it to match or leave it as is. Finished in a high quality white or black gel coat. Sold MC28 - Mirrors, Left and Right. Left mirror is in good shape with some very minor scuffs, right mirror is not so lucky. Not the prettiest around, but functional. The mirror lenses are not damaged, however one of the bolts has broken. Make me an offer. Sold MC21 NSR250R and NSR250R SP Factory owners manual in excellent condition. This was the original manual that came with the bike and tool kit when you bought it new over 10 years ago. JAPANESE ONLY. Serious offers over 50 dollars. Top Rider - the movie. 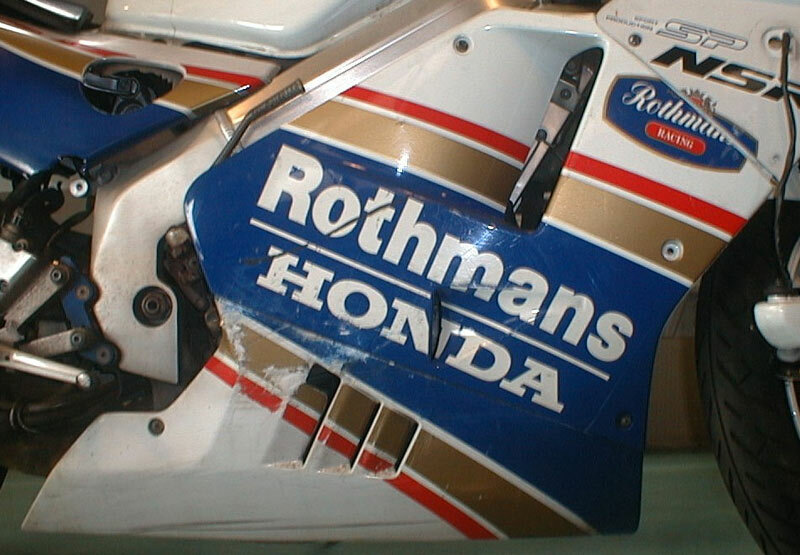 Before there was Full throttle and Legends of Speed, there was Top Rider. 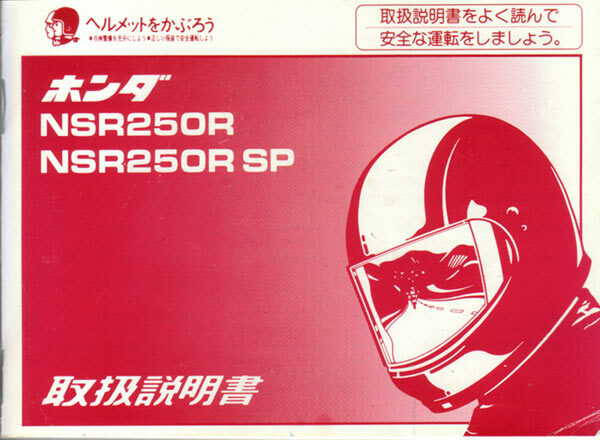 This was a B - class Japanese film about a Japanese racer who tries to be like his Father, a top racer who unfortunately was killed in a racing accident. Will he make it big like his Father ?? MC21 - Left side bracket for the gear change side. 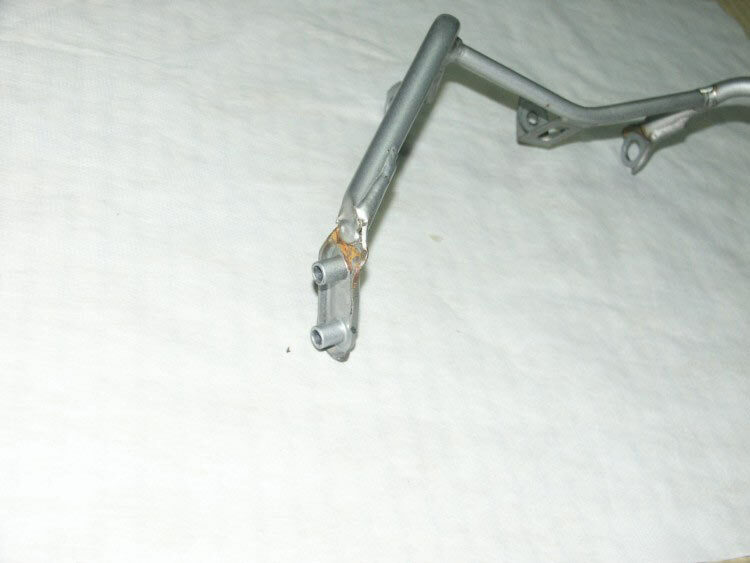 Foot peg has been shortened but fine, comes with part of the linkage. I will try to get a picture soon. Left side only !! for the actual shipping and packaging cost. I accept cash or beer as payment. All parts sold as is and with no warranty.